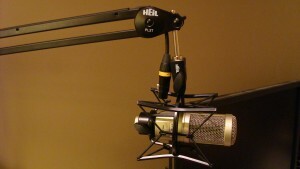 My goal with this tutorial is to quickly get you set up and recording with your new Heil PR 40 microphone so that you can start creating podcasts, video tutorials, voiceovers, or whatever else you need to record. Not all of the equipment listed below is required; I show you a few different scenarios depending on what devices you have. 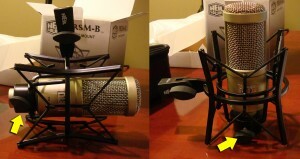 This is what I would have liked when setting up my own equipment, as it would have saved me hours. I hope you enjoy. If you have any questions, comments, or tips for improvement, please leave them in the comments at the end of this article. 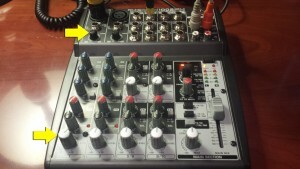 Behringer U-Control UCA222 – I show you how to connect with and without this device. 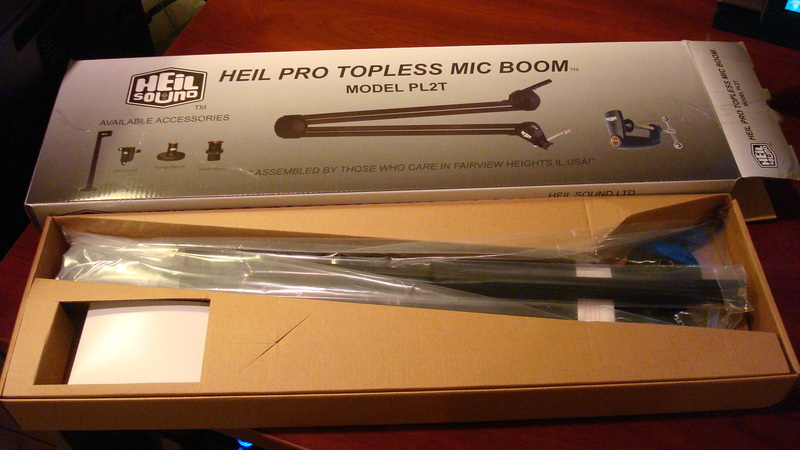 Unbox your boom mic. You’ll find 3 items (no instructions). A C-clamp that holds the boom arms. 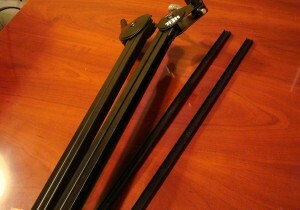 Tops (2) that will cover the XLR cable that runs along the boom arms. 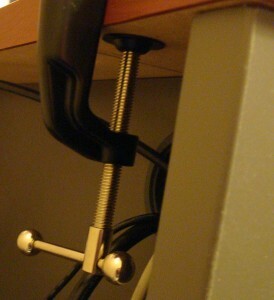 Install the C-clamp on the edge of your desk or wherever you want the boom to be installed. Spin the lever until there is a large enough gap to fit the ledge. Position your C-Clamp as preferred and then tighten. 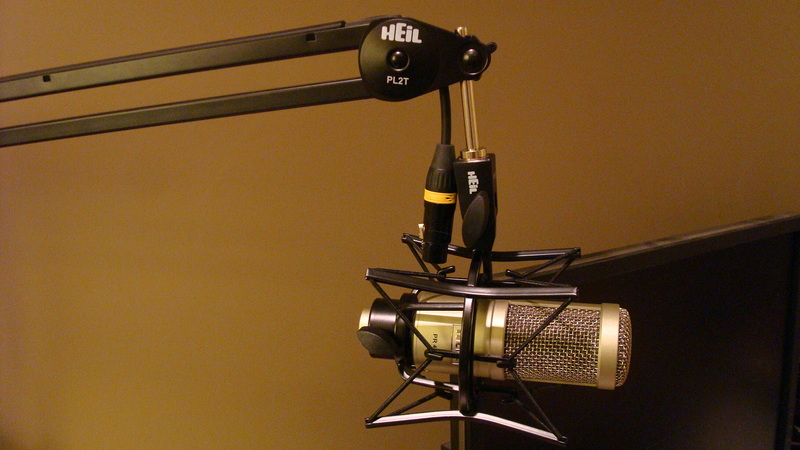 In this step, we will place the XLR cable in the mic’s arms and then snap the 2 tops in place to hold the cable. 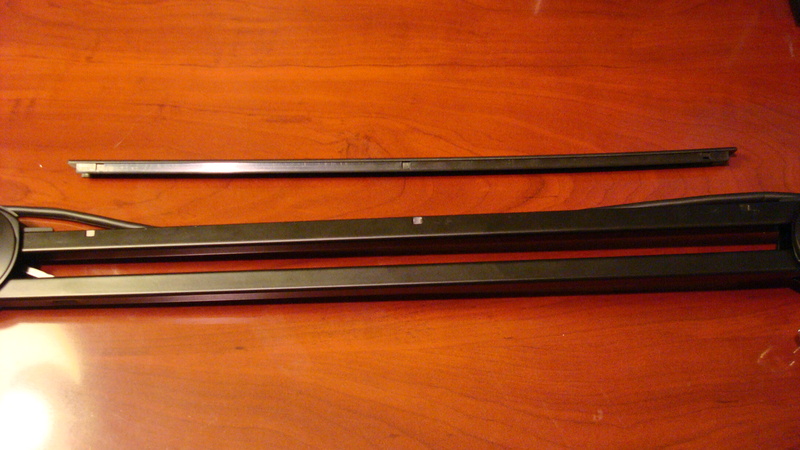 These pieces are displayed below. 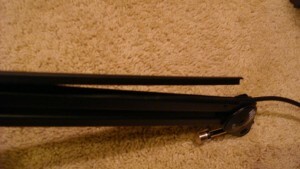 Set the boom on the ground or in a position that makes it easy for you to run the cable along the arms. 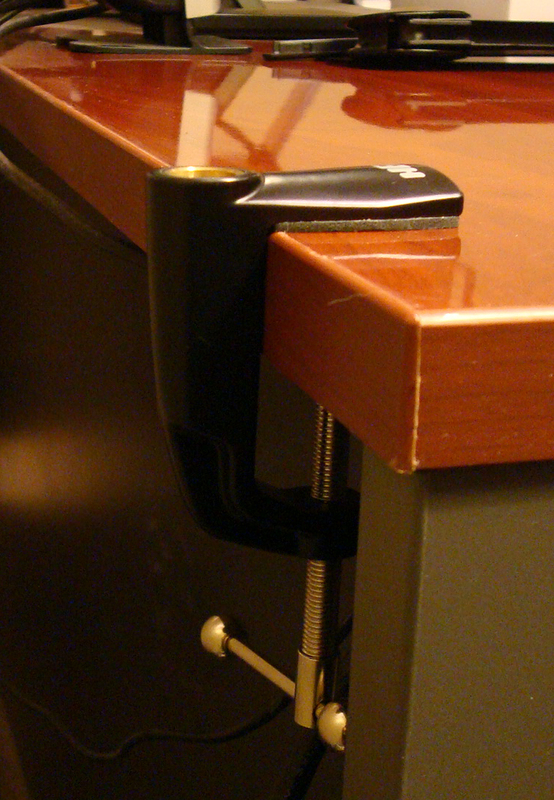 You will want to leave a little slack at the top where the hinge is. Once the XLR cable is in place, snap the 2 tops in place so that it covers the cable and holds it in place. These tops are polarized and will snap in only when placed in the proper position. 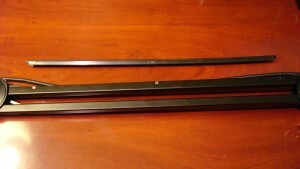 Look for markings on the inside of the tops and position properly to snap in. 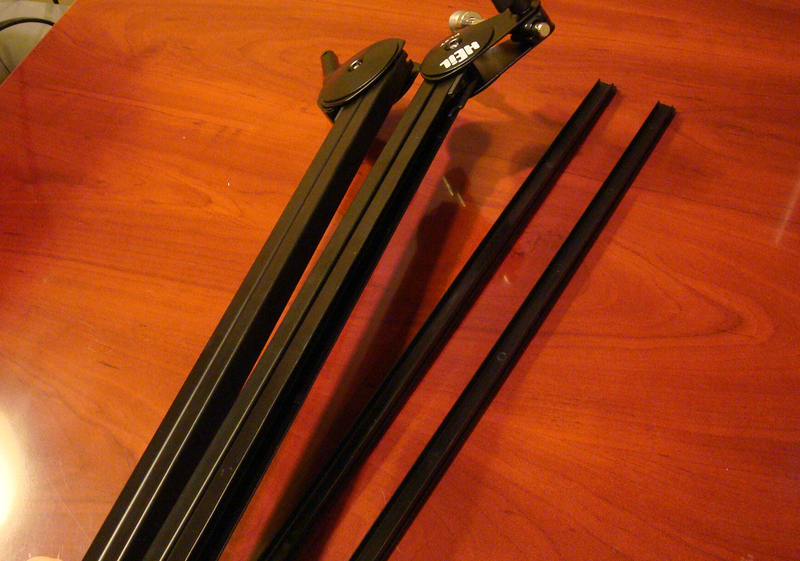 The next step, which is your choice, is to decide whether you want to hang the XLR cable over the boom arm, or if you want to run it through the center. I chose to run it through the center. 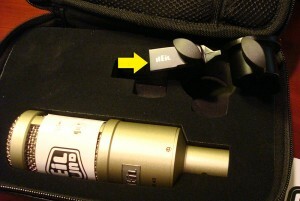 To do this, you need to take out the chrome mic holder stem (using the side tri-knob) piece shown in the image below. 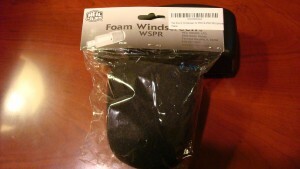 Be careful when unscrewing this, as there are 2 small washers which can fall and get lost. Pay attention to these pieces and how they fit together when you take them out so that you’ll remember how they fit back in place. Shows XLR cable either hanging over arm, or going through arm. 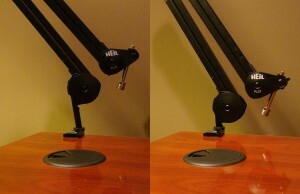 After you have the cable through, put back the silver attachment and bolts. The finished product should look like this. 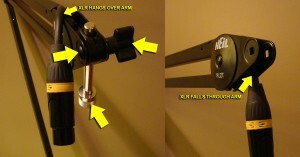 Install the boom arm into the clamp by inserting the bottom end of the boom arm into the brass portion of the C-clamp. It should fall right in and sit. Some of you might not have this shock mount and instead use what came with the microphone. 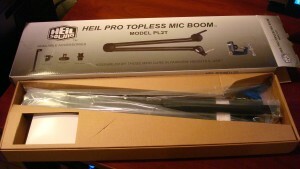 If you do, you might need to remove the black metal washer that sits inside the stock mic holder so that it can thread/screw onto the boom arm properly. 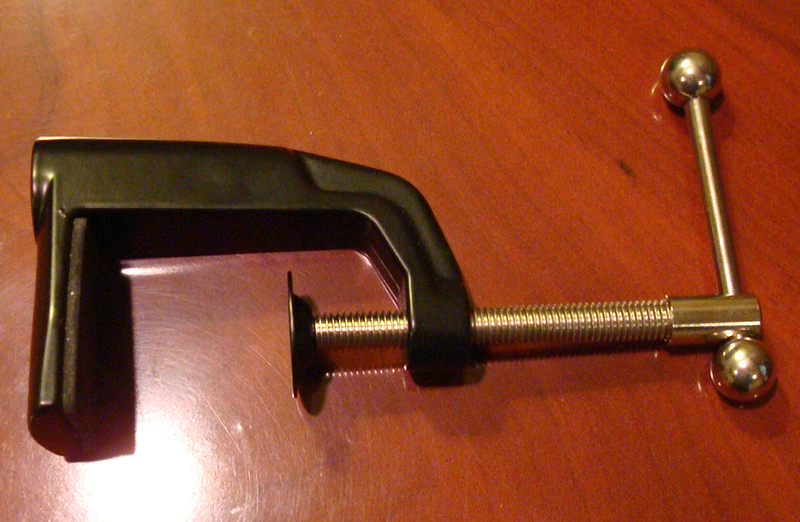 If you don’t remove this piece, the threads won’t fit. 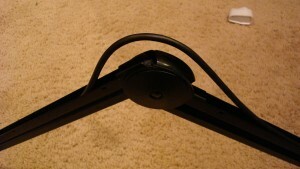 You can remove it by pressing down and rotating it with your finger until it comes out. See the second image below. 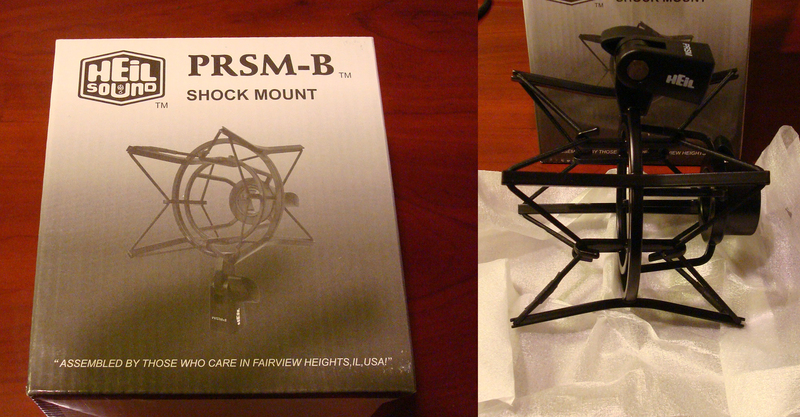 This mount is different from and better than the mic holder that comes with your PR 40. Unbox your Heil PR 40, then loosen the knob on your shock mount and insert the microphone through. 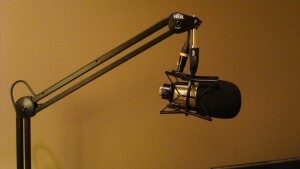 Once in place, tighten the knob to hold the mic. Put the mic boom attachment in a place where you can screw on the shock mount. Simply slide the windscreen over the end of your microphone and you’re done. Step 1) Connect your XLR cable from the end of your mic into the MIC port in the top left of your mixer. Step 2) Connect your headphones into the Phones port in the top center of your mixer. 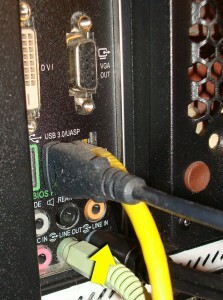 Step 3) Plug your cables into the L (left) R (right) Out ports in the top left of your mixer and plug the other end into the “Line In” port (this will be built into your motherboard if you don’t have a separate sound card) on the back of your computer. I’m sure there are more settings to achieve better quality, but my goal is to get you up and running. In the picture above, the only 2 settings that I’ve been playing with and have found to make a difference are highlighted with the arrows—the Level (bottom white) and Gain (top black). 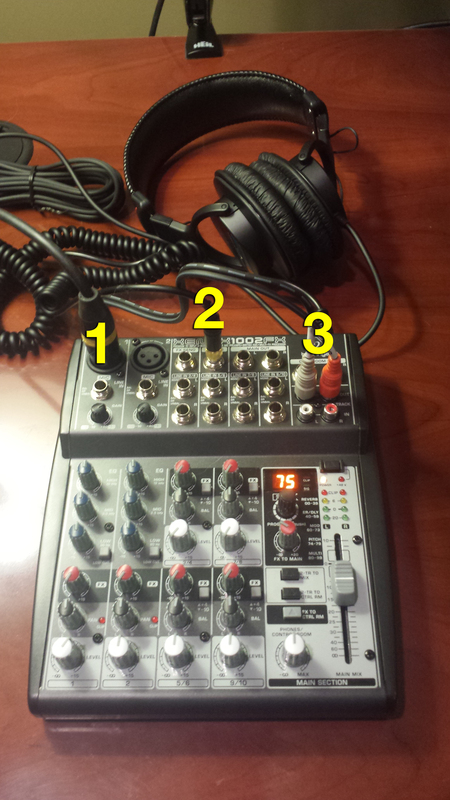 I still have more to learn with this mixer, but I’ve found that adjusting those 2 settings will get you decent sound quality. 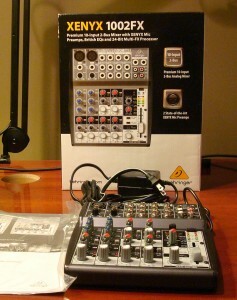 Next, plug the power cord into the back left of the mixer and you’ll be ready to record. There isn’t an on/off switch with this mixer. That’s it for now. 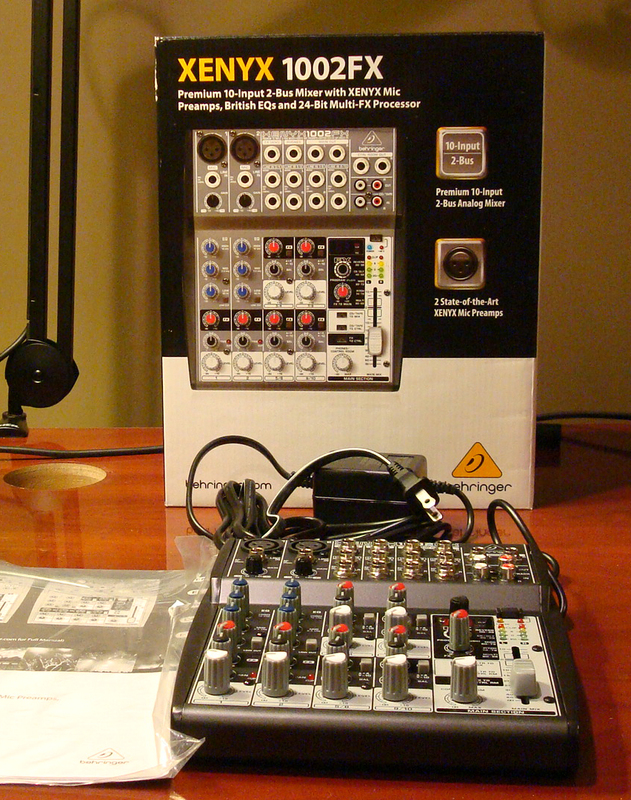 Later I will discuss using the UCA222 and tips for quality improvement with the mixer settings. Please check back, as I’ll be adding more to this tutorial.